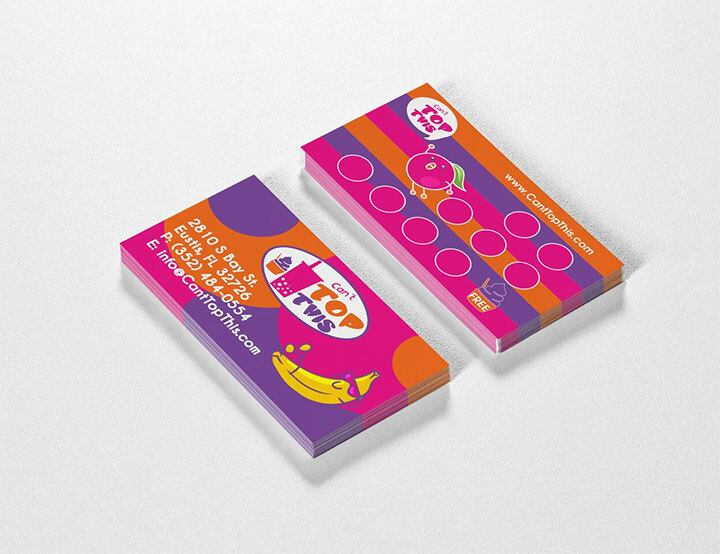 A new boba tea and frozen yogurt store interior design came to life, courtesy of Mindful Design Consulting, together with the necessary collection of marketing and brand essentials, from the store’s logo to the design of its loyalty cards. 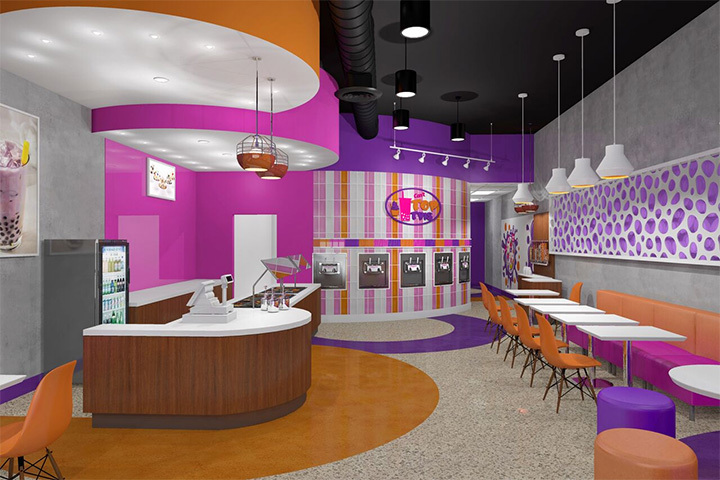 Playing with the idea of sweet and fresh treats, we came up with an equally sweet and fresh interior for Can’t Top This boba tea and frozen yogurt store in Eustis, Florida, located at 2810 S Bay Street. We chose pink, purple and orange as the main chromatic combination, and we paired it with neutrals for balance and contrast. Starting with gray floors and walls, we added details in vibrant colors that emphasized the shapes and angles of the walls and ceiling, and helped define functional areas. The curved ceiling elements above the counter were highlighted with orange and pink paint, which accentuated their uneven height and architectural virtues. These curved lines were echoed in the epoxy floor treatment, where the counter, self-serving area, entrance and part of the sitting area were designated by large circular designs. We wanted an inviting space, with no visual asperities. Repeating the circular motif throughout the entire store, whether in the shape of the light fixtures, the stools or the counter, helped create a welcoming interior. A few straight angles balanced these soft contours, like the ones in the square tables, the sleek, simple benches and a few well defined wall and ceiling lines. 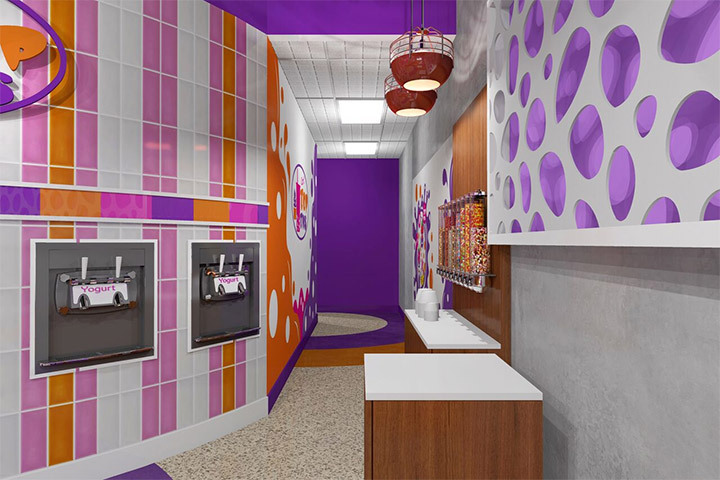 We chose a modern decor for this New Boba Tea and Frozen Yogurt Store interior design, with just a touch of “mid-century diner” in the tile wall design of the self-serving area. The choice was important in putting together an open and airy space. Recessed decorative wall panels used in combination with modern and industrial light pendants continued the same modern theme. We kept patterns to a minimum, emphasizing colors and textures instead. 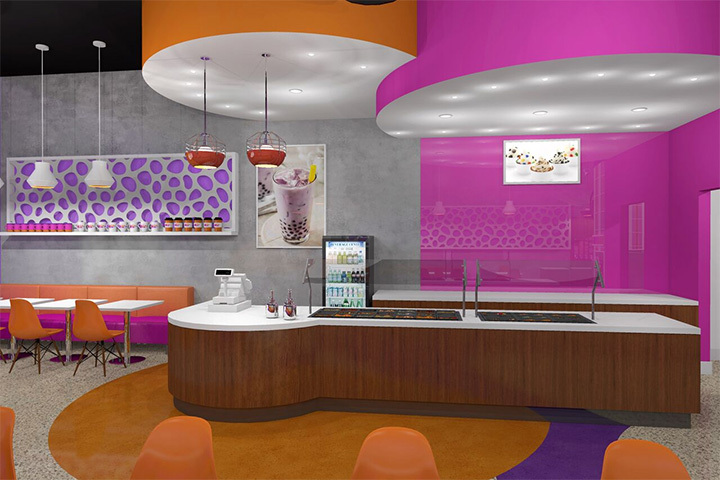 The lively hue combination reflects the appetizing choices offered by this new Boba Tea and Frozen Yogurt store, and their burst of flavors. However, we felt that we needed a grounding color and textures, so we used a faux concrete paint for the walls as well as almost black color for the ceiling for the ceiling. The contrast brought the space together and made the bright colors shine. In addition, we created a few eye-catching wall graphics, that introduced colorful characters and added back-lit decorative wall panels with cutout pattern for visual interest. We lined the counter with wood, to bring in the warmth of a natural material. Combined with metal, tile and other materials used throughout the store, it created some texture variety that made the space more interesting and visually comfortable to be in. 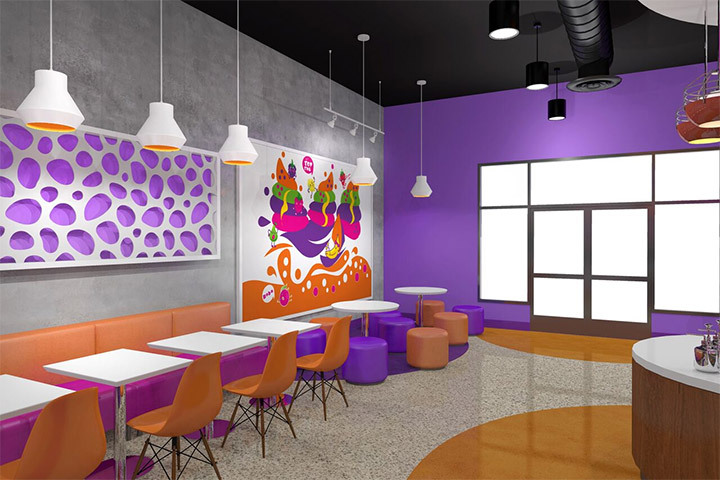 The Can’t Top This new Boba Tea and Frozen Yogurt store logo retains the same elements as the frozen yogurt store interior design – the curved lines, the fresh color palette and the playful treatment of the subject. 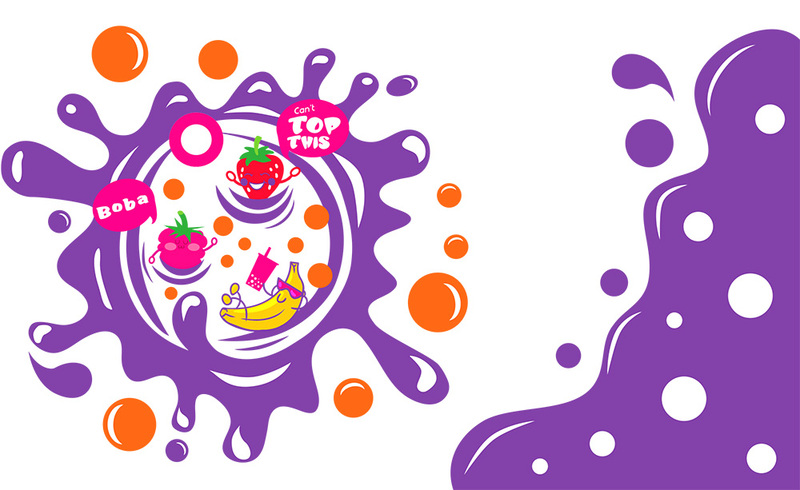 As for the loyalty and business cards, they are equally colorful and easy to spot, a constant reminder to come back.